A Destination Wedding On Your Mind? Here Are The Most Popular Foreign Locations Of 2018! 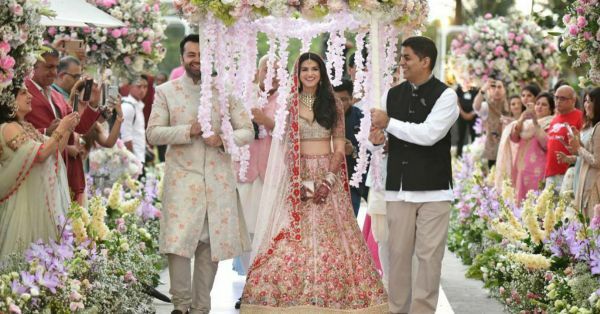 After Deepika and Ranveer's dreamy Lake Como wedding and Priyanka and Nick's royal Udaipur celebrations, a destination wedding seems to be the trend of the season. If you too prefer to have an intimate wedding, we've got for you a list of 101 wedding destinations in India. But if your budget allows you to host the wedding out of India, we have you sorted for that too. We have curated a list of the nine best foreign destinations to tie the knot. You must also check out this list of countries that you do not require a visa for. Whether you want to get married in a Wineland (the African version of vineyards) or you want the mountains to serve as your backdrop, South Africa has a lot to offer. From scenic beaches to a rustic mehendi set-up in a jungle resort, the country has something for every kind of bride. Do arrange a jungle safari for your guests! If you are a Bollywood buff and wish to get married at one of B-town's favourite wedding destination, then you don't need to look beyond Italy. Florence and the rest of Tuscany, Positano Rome, Sicily, Lake Como, Venice—Italy is full of picture-perfect and world-renowned wedding destinations. Even past these famous places, Italy has many other gems that are undiscovered and would make for a dream wedding destination. Are you the couple who would like their special day to be larger-than-life? Well, you've got to pick California then! Book a glitzy hotel and get ready to have the time of your life with your loved ones. Include hiking tours and wine tasting sessions in your wedding itinerary and we bet your guests will never forget the eventful week. Want to plan that destination wedding on a budget? Why travel halfway around the world when you have the beautiful beaches of Thailand just a few hours away?! Pick a boutique hotel in Koh Samui or Krabi and get set for a beachside wedding ceremony that you've always dreamt of. Yet another South Asian country, Bali has become the official destination of Indian weddings in the recent past! The island with its pristine beaches, lush greenery and exotic resorts attract a lot of couples for their wedding. Its close proximity to India is another major plus point. A year-round destination steeped in history, Istanbul is sure to lend a royal touch to your wedding pictures. Think dreamy sunsets, historical backdrops and Turkish cuisine, do we need to say more?! Plus, you and your bae can takeoff for your Europian honeymoon straight from the wedding venue! Distinguished by its Arabian and European cultural influences, Morocco has a magical spirit and a bohemian vibe that makes it a distinctive choice for your wedding. The city’s architecture and gardens create a beautiful setting and if a desert tour has always been on your bucket list, you need to put Morocco right on top of your wedding wishlist! Now, do we even need to give you a reason to get married in Greece? It's easily one of the most romantic destinations with it's white and blue houses and crystal clear beaches. With some of the best beachside clubs in the world, we can already imagine you hosting a mehendi brunch there! An island in the North Atlantic, Ireland offers some of the most breathtaking views. If an intimate wedding, set against gorgeous backdrops is all you've always dreamt off, Ireland is your place. The Irish are warm and welcoming and so is their whiskey! A tasting session on your cocktail night sounds fun, right? !